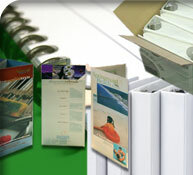 Print your project have it delivered to you for kiting and finishing or to a third party for finishing services like shrink wrapping, perfect binding, mailing, warehousing and fulfillment. Universal prints on-demand or conventional offset, whichever is most cost effective, then finishes, kits, warehouses, fulfills, delivers or mails to your distribution list per your requirements. This all happens under one roof with only one clean professional relationship to manage. 100% guarantee. If your not satisfied we’ll make it right. Joe, Just wanted to thank you and Don for working so hard to get our new business cards done before our launch day. I know it's not ideal to work on the weekends- so I REALLY appreciate the both of you doing so. We have gotten several compliments on the cards. I know I'm excited to hand them out! Thanks Again- Great Job!